SINGAPORE & SULZEMOOS, GERMANY --(eSolarEnergyNews)--Singapore’s Phoenix Solar Pte Ltd has been awarded a contract by IKEA Southeast Asia to design and build a 1 MWp solar system on the roof of IKEA Tampines. The system is expected to generate 1.3 million kilowatt hours per year – enough renewable energy to power the equivalent of 283 four-room HDB flats. IKEA expects to trim an estimated $2.4 million from the store’s electrical bills over the next ten years. 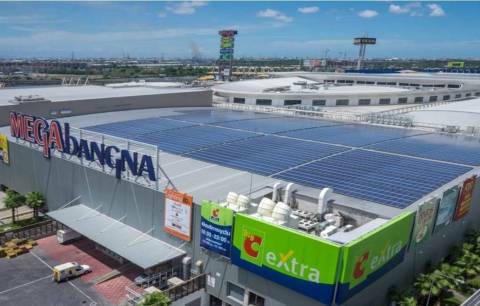 This project follows the successful 1 MWp solar rooftop system installation on top of the company’s Megabangna mall in Bangkok and is the start of additional collaborations already in the pipeline between IKEA Southeast Asia and Phoenix Solar. Phoenix Solar Pte Ltd is the Singapore based subsidiary of Phoenix Solar AG (ISIN DE000A0BVU93), an international photovoltaic (PV) system integrator listed on the official market (Prime Standard) of the Frankfurt Stock Exchange. The contract with the IKEA franchisee is based upon a non-exclusive regional framework agreement executed recently between the two companies covering turnkey services for engineering, procurement, installation, operation and maintenance (O&M) of commercial rooftop solar PV systems. The agreement provides a streamlined procurement process while maintaining competitive pricing strategies. Sustainability is an integral and natural part of the everyday business for IKEA Southeast Asia, driven by a vision to create a better everyday life for the many people. The company consistently strives to have a positive impact on the planet and people while operating and expanding its retail business in Singapore, Malaysia and Thailand. Solar PV systems play a vital part. The IKEA Cheras store in Kuala Lumpur already has a similar system on its rooftop. Megabangna, the spacious Bangkok mall anchored by IKEA, was among the first large commercial enterprises in Thailand to feed electricity into the city grid under the feed-in tariff solar rooftop program started by the government in 2014. “We expect a positive impact – commercially and environmentally - from the Singapore project and from further cooperating with Phoenix Solar in our other regional projects in Southeast Asia,” says Mr. Rojkjaer. Eric Fleckten, Phoenix Solar Senior Vice President Asia/Pacific, added: "We are proud to expand our cooperation with IKEA Southeast Asia on a new contractual basis and with another project supporting the company’s move towards clean energy by providing top-class solar PV systems on time and on budget. The cooperation is a strong contribution to our strategy of sustainable and profitable growth in the region." Installation of the solar panels begins at IKEA Tampines in March and the project is expected to be completed in July. Phoenix Solar AG, with headquarters in Sulzemoos / Munich, Germany, is an international photovoltaic systems integrator. The Group develops, plans, builds and operates large-scale photovoltaic plants. As an EPC contractor specializing in the design and execution of solar power plants, Phoenix Solar places special emphasis on the “on-time and on-budget” construction and delivery of solar power plants, optimized to deliver superior output. With subsidiaries on three continents, the company has designed and built some 800 MWp of turnkey systems since its founding. The shares of Phoenix Solar AG (ISIN DE000A0BVU93) are listed on the official market (Prime Standard) of the Frankfurt Stock Exchange. www.phoenixsolar-group.com. We own and operate IKEA stores in Singapore, Malaysia and Thailand, offering millions of people in Southeast Asia access to a large range of well-designed, functional home furnishing products at affordable prices. We develop, own and operate Shopping Centres anchored by IKEA, and create vibrant destinations by investing in residential, office and other types of real estate. Our multi-national team has projects in the pipeline and an ambition to double our business in coming years. We are part of the Ikano Group of companies and the only IKEA franchisee in the world today owned by the Kamprad family that founded IKEA.